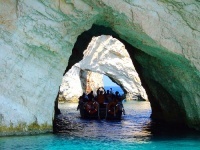 Located near a picturesque village called Volimes, the Blue Caves are one of Zakynthos Island's best-loved attractions. Only accessible by boat, these striking rock formations put on an unforgettable show. Essentially, the caves capture and reflect light in a marvellous variety of blues. Visitors will enjoy the best displays at sunrise, sunset, or from under water while scuba diving. Oftentimes, visitors can enjoy round-island boat trips that include the caves and Navagio Beach, with its famous shipwreck. Small, 25-passenger boats are generally more pleasant than 300-seaters. As a selling point, they can sail into the caves, which is a magical experience.